I’ve had many requests for an easy nut-free, gluten-free and dairy-free portable snack. Most schools are nut-free these days and kids need to bring safe snacks. 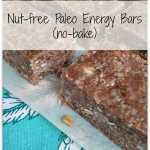 I love no-bake bars so I went to work in the kitchen to come up with allergy-friendly paleo energy bars. I wanted to create an energy bar that wasn’t too sweet and would provide lasting energy for a busy morning or afternoon. These bars would also be great to have before workout. Having a couple of snack options like these bars planned out for the week will save you time and help you make healthier choices. Snacks are often overlooked when you make your grocery list and meal plan. If you are still struggling with making meal planning a habit, please check out my newest program, The Dinner Time Solution. I would love to help you save time, money and have more fun in the kitchen while improving your health. Put the dates, coconut oil and sunflower seeds in a food processor and blend until somewhat chunky mixture forms. It’s okay if you can still see some sunflower seeds. Add the rest of the ingredients and pulse until well combined. The mixture should be chunky and sticky looking. Spoon the mixture into a 9X9 inch pan lined with parchment paper. Press down firmly so the bars will be tightly packed. Chill for about 1-2 hours until firm. Slice into bars. Store them in the fridge or wrap them individually and place them in the freezer. 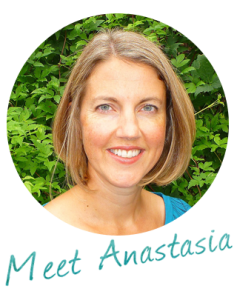 Fabulous bars Ana – I love them! The coconutiness of them is awesome. I will enjoy them over my weekend of racing! What a great snack idea. I love that is is gf df! I made these yesterday and they went over well with the kiddo! I had to take the dates out of the food processor and chop them by hand, my little machine couldn’t handle them whole. I’m part happy and part sad we can’t share them with daddy…. I’m glad they were a hit with B! When I made them I used a fresh box of dried dates & my food processor was able to handle it. Dates on the dry side don’t seem to work as well.